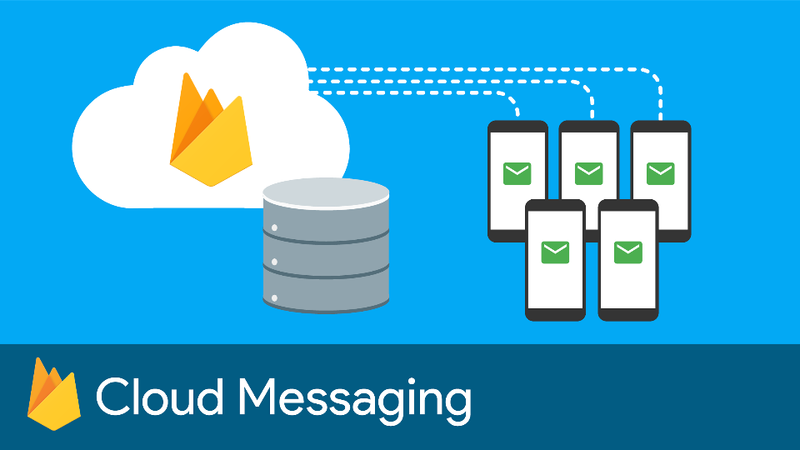 With the announced expansion of Firebase at Google I/O recently, we also introduced Firebase Cloud Messaging (FCM) and Firebase Notifications (FN). As a developer, there are lots of updates that you might be able to take advantage of. Despite the switch to FCM, we’ll continue to support Google Cloud Messaging on Android, iOS and the Web because we know that you have applications using the previous SDKs to handle notifications. However, all new client side features will be added to FCM SDKs moving forward. As such, we strongly recommend that you upgrade to the FCM SDKs. You can learn more about them here. FCM supports everything that you’ve come to know with Google Cloud Messaging including addressing single devices, groups of devices or topics. The FCM SDK simplifies client development. For example, you no longer need to write your own registration or subscription retry logic. When it comes to your server (if you still want to use one), updates to the endpoints and protocol don’t incur breaking changes, so as to maintain backwards compatibility. The updated details are available in the FCM Server documentation. We’re investing heavily in making Firebase our unified mobile platform. We’re also continuing to expand our messaging platform beyond Android, including iOS and the Web. Firebase is well known for it’s cross-platform capabilities, so FCM is a natural fit for the ongoing Firebase releases. If you want to learn how to migrate your current app from Google Cloud Messaging to FCM, we’ve provided guides here for Android and iOS. We think that Google Cloud Messaging will be even more useful to you when integrated into Firebase, including the new Firebase Notifications console. With that you’ll be able to send messages to apps directly from the console -- without you needing to build a messaging server. To upgrade from Google Cloud Messaging to FCM or to learn more, see our guides for Android and iOS apps. 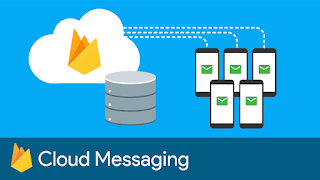 This entry was posted in Google Developers Blog and tagged Firebase, Firebase Cloud Messaging, Google Cloud Messaging on May 31, 2016 by Google Devs. This entry was posted in Google Chrome Releases and tagged Beta updates, Chrome OS, Google Chrome on May 31, 2016 by Bernie Thompson. This entry was posted in Google Chrome Releases and tagged Dev updates, Google Chrome on May 31, 2016 by ananthak. In-between daydreaming about virtual reality and saying Allo to Duo, there were some fantastic Google Cloud Platform sessions and demos at Google I/O this year. In case you weren’t able to attend the show, here are the recordings. In One Lap Around Google Cloud Platform, senior developer advocate Mandy Waite, and Brad Abrams walk through the process of building a Node.js backend for an iOS and Android based game. Easily the best bit of the session is a demo that uses Kubernetes and GCP Container Registry to deploy a Docker container to App Engine Flexible Environment, Google Container Engine and an AWS EC2 instance. 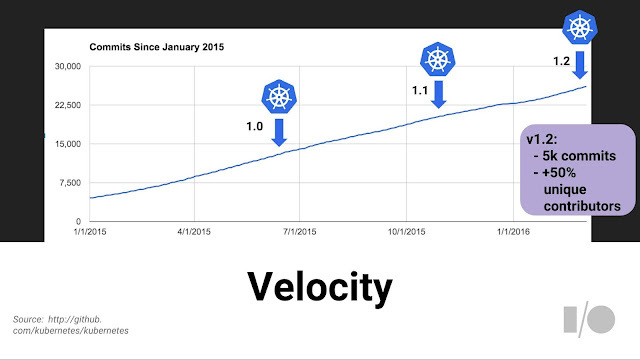 It’s a simple demo of portability across clouds, a key differentiator for GCP. Speaking of multi-cloud environments, developer advocate Aja Hammerly presented a great session on Stackdriver, called Just Enough Stackdriver To Sleep Well At Night, which will be music to the ears for any of you who have to carry a pager to support your site or application. In a nutshell, Aja shows how Stackdriver unifies a bunch of different monitoring and management tools into a single solution. If you’ve made the leap to containers or are thinking about it, you’ll want to check Carter Morgan's session: Best practices for orchestrating the cloud with Kubernetes. This session includes the basics of modern day applications and how containers work. It also covers packaging and distributing apps using Docker and how to up your game by running applications on Kubernetes. Did you know Kubernetes has seen 5,000 commits and over 50% from unique contributors since January 2015? Next, IoT ideas are a dime a dozen, but bringing them to life is another story. 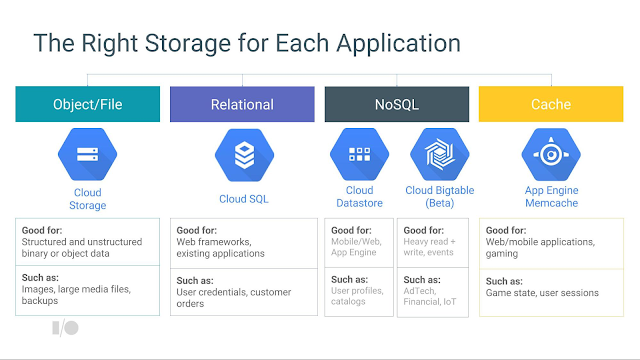 In Making sense of IoT data with the cloud, developer advocate Ian Lewis shows how you can manage a large number of devices on GCP and how to ingest, store and analyze the data from those devices. In Supercharging Firebase with Google Cloud Platform developer advocates Sandeep Dinesh and Bret McGowen use Firebase to build a real-time game that interacts with virtual machines, big data and machine learning APIs on GCP. The coolest part of the demo involves the audience in the room and on the livestream interacting with the game via Speech API, all yelling instructions at the same time to move a dot through a maze. The hallmark of Firebase — real-time data synchronization across connected devices in milliseconds — is on display here and fun to see. For more Firebase tips and tricks check out Creating interactive multiplayer experiences with Firebase, from developer advocate Mark Mandel. Switching gears to big data and the upcoming U.S. presidential election, developer advocate Felipe Hoffa and software engineer Jordan Tigani, demo the power of Google BigQuery to uncover some intriguing campaign insights in Election 2016: The Big Data Showdown. You'll learn which candidate is spending the most money and how efficient that spending is relative to their mentions on TV, by mashing together various different public datasets in BigQuery. Felipe and Jordan do a nice job showing us how BigQuery can separate the signal from the noise to figure out what it all means. Figuring out the right storage for each application in your business can be a daunting task on the cloud. Dominic Preuss, group product manager, explains how in Scaling your data from concept to petabytes. And of course, no event that includes Cloud Platform is complete without demos from developer advocates Kaz Sato on How to build a smart RasPi bot with Cloud Vision and Speech API, and another crowd-pleaser, Google Cloud Spin: Stopping time with the power of Cloud, from Francesc Campoy Flores. To find more tutorials, talks and demos on GCP beyond the sessions at I/O this year, check out our GCP YouTube channel and weekly podcast, and follow @GoogleCloud on Twitter for all the latest news and product announcements from the Cloud Platform team. This entry was posted in Google Cloud Platform Blog and tagged Google Cloud Platform on May 31, 2016 by GCP Team. 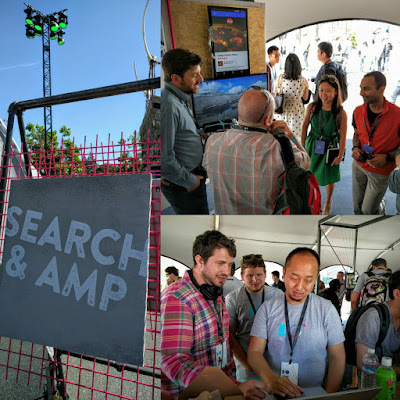 Two weeks ago, over 7,000 developers descended upon Mountain View for this year’s Google I/O, with a takeaway that it’s truly an exciting time for Search. People come to Google billions of times per day to fulfill their daily information needs. We’re focused on creating features and tools that we believe will help users and publishers make the most of Search in today’s world. As Google continues to evolve and expand to new interfaces, such as the Google assistant and Google Home, we want to make it easy for publishers to integrate and grow with Google. In case you didn’t have a chance to attend all our sessions, we put together a recap of all the Search happenings at I/O. 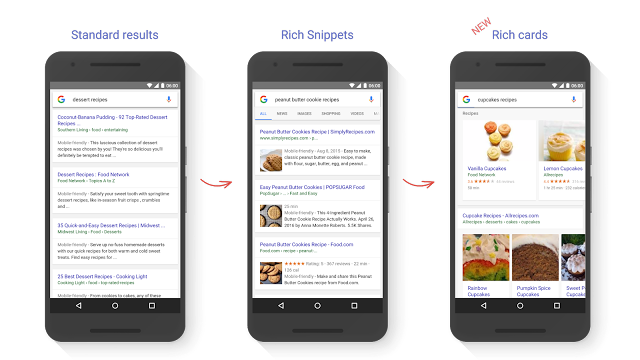 We announced rich cards, a new Search result format building on rich snippets, that uses schema.org markup to display content in an even more engaging and visual format. Rich cards are available in English for recipes and movies and we’re excited to roll out for more content categories soon. To learn more, browse the new gallery with screenshots and code samples of each markup type or watch our rich cards devByte. We want to make it easy for webmasters and developers to track and measure their performance in search results. We launched a new report in Search Console to help developers confirm that their rich card markup is valid. In the report we highlight “enhanceable cards,” which are cards that can benefit from marking up more fields. The new Search Appearance filter also makes it easy for webmasters to filter their traffic by AMP and rich cards. Users are searching for more than recipes and movies: they’re often coming to Search to find fresh information about what’s happening right now. This insight kickstarted our efforts to use real-time indexing to connect users searching for real-time events with fresh content. Instead of waiting for content to be crawled and indexed, publishers will be able to use the Google Indexing API to trigger the indexing of their content in real time. It’s still in its early days, but we’re excited to launch a pilot later this summer. We provided an update on our use of AMP, an open source effort to speed up the mobile web. Google Search uses AMP to enable instant-loading content. Speed is important---over 40% of users abandon a page that takes more than three seconds to load. We announced that we’re bringing AMPed news carousels to the iOS and Android Google apps, as well as experimenting with combining AMP and rich cards. Stay tuned for more via our blog and github page. In addition to the sessions, attendees could talk directly with Googlers at the Search & AMP sandbox. We updated the popular Structured Data Testing tool. The tool is now tightly integrated with the DevSite Search Gallery and the new Search Preview service, which lets you preview how your rich cards will look on the search results page. We announced App Indexing’s migration to Firebase, Google’s unified developer platform. Watch the session to learn how to grow your app with Firebase App Indexing. App streaming is a new way for Android users to try out games without having to download and install the app -- and it’s already available in Google Search. Check out the session to learn more. We also revamped our developer documentation, organizing our docs around topical guides to make it easier to follow. Thanks to all who came to I/O -- it’s always great to talk directly with developers and hear about experiences first-hand. And whether you came in person or tuned in from afar, let’s continue the conversation on the webmaster forum or during our office hours, hosted weekly via hangouts-on-air. This entry was posted in Google Developers Blog and tagged Featured, Google I/O, Search on May 31, 2016 by Google Devs. In the past year, we’ve made some changes to the Google bar that is displayed across the top of most Google apps. For instance, if a user has a picture associated with their account, they’ll see that picture in the Google bar; if they don’t have a picture, they’ll see their initial. Because these changes have made it easier for account owners to identify the account they’re currently signed into and using, there’s no longer a need to display their name in the Google bar as well. With that in mind, starting today, account owner names will disappear from the space next to the app launcher in the Google bar in any Google apps where they previously appeared. This entry was posted in Apps Feed Blog and tagged apps, Rapid Release, Scheduled Release on May 31, 2016 by Jane Smith. This entry was posted in Google for Work Blog and tagged customer love, Gone Google, Google Apps for Work, Google Docs, Google Drive, Google for Work, Google Forms, Google Hangouts on May 31, 2016 by Jane Smith. This entry was posted in Public Policy Blog and tagged Public Policy on May 31, 2016 by Google Public Policy Blog. This entry was posted in Public Policy Blog and tagged Google in Europe, Public Policy on May 31, 2016 by Lie Junius. 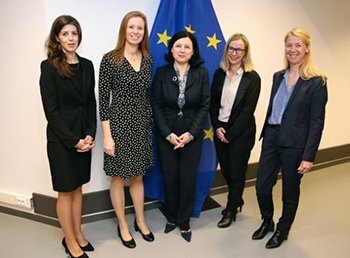 We have always prohibited illegal hate speech on our platforms, and we have Community Guidelines that set the rules of the road on YouTube, including prohibitions on hate speech, terrorist recruitment and incitement to violence.